More fishermen died in 2005. Loggers and commercial pilots record lower fatality rates. NEW YORK (CNNMoney.com) -- A lobsterman drowned off the New Hampshire coast early in August, after he got entangled in nets and dragged overboard. A day or two before that a Washington logger was struck in the neck and killed by a log that had worked loose and rolled down a hillside. 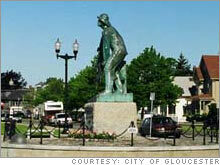 The Gloucester fisherman monument records all the fatalities the town's fishermen have suffered over the decades. More than 10,000 names are listed. In central California on August 5, a crop duster pilot crashed and died. For many occupations danger is part of the job description. That is made abundantly clear every year when the Bureau of Labor Statistics releases its annual census of fatalities in the workplace. The report for 2005, released this week, includes data on fatal work-related injuries by industry, gender, age and, especially, by occupation. The BLS does not count combat deaths in its survey; if it did, the military would undoubtedly have qualified as America's most dangerous job last year. Fishermen It was another tough year for fishermen in 2005; 48 died, up from 38 the year before. That made it the nation's most dangerous occupation in 2005, with a fatality rate of 118.4 per 100,000 - nearly 30 times higher than the rate of the average worker. Fishermen go out to the sea in ships in some terrible weather conditions, especially in heavy New England seas and Aleutian Island storms, and a fall overboard often results in death by drowning. They also work with dangerous power tools such as huge winches and hoists, as well as heavy nets and cages, all of which can turn into lethal missiles on a slippery wet or icy deck in heavy seas. Loggers This group kept its tragic status as one of the most dangerous occupations by recording 80 deaths, a fatality rate of 90.2 per 100,000. That's an improvement from a year earlier, when there were 85 logging fatalities. Loggers deal with mammoth weights and irregularly shaped tree trunks that can be very difficult to control. In addition, they may be injured in remote areas far from medical help and succumb to injuries that might not otherwise have been fatal. Flyers Flyers had a safer year, with their fatalities dropping nearly 26 percent to 81. That still was enough to qualify the profession as the third-most dangerous with a rate of 66.9 per 100,000. Overall, it was a safer year for American workers; total work-related fatalities declined slightly - 5,702 died, about 1 percent fewer than in 2004. One of the most mundane parts of the work day - driving - proved fatal for more workers than any other: 2,480 died in transportation accidents, more than 43 percent of all fatal workplace occurrences. Assaults and other violent acts contributed to danger in the workplace: 14 percent of all fatalities were due to these. Fifty policemen and sheriff's patrol officers were murdered on the job, and another 81 died in traffic accidents and other incidents. The tragic toll added up to 18.2 fatalities per 100,000 workers. The most dangerous industry in terms of total killed was construction, where 1,186 workers died. The rate of 11.0 per 100,000, however, trailed the agricultural segment (32.5 per 100,000), which included fishing and logging; mining (25.6 per 100,000); and transportation and warehousing (17.6 per 100,000), where many drivers died in traffic accidents. Of the 339 construction workers who died, about 32 percent of them suffered fatal falls of a story or more. The good news is that after the BLS began publishing its census on fatal occupational injuries in 1992, the number of worker deaths has trended steadily down since 1994, when 6,632 workers died. That's a 14 percent drop, but even that understates how much safer workers are on the job: The number of workers has also grown more than 14 percent since 1994, meaning the fatality rate has dropped by about 30 percent.